I HAVE HAD MANY REQUESTS JUST TO COME AND PLAY A COUPLE OF SONGS . . . It requires a complete setup for me to do what I do at or in any venue. This is what I do and why I can sound so good. My act involves 30 minutes of unloading/setup (30 min teardown/reloading). This is an hour that I do charge for outside of the hourly playing time charge. I have a two hour minimum and charge for it even if the customer only wants an hour of actual music. So, for example, a two hour engagement is 3 x hourly rate, plus travel expenses. Commercial gigs (ones that give me multiple and regular dates) are charged a lower rate. This is because they give me a larger quantity of gigs with usually no surprises* after the first gig. Finding that there's no parking near the venue. That it's a difficult setup . . like climbing flights of stairs carrying my equipment. Often finding no electrical outlet or no electric at all within 150 feet of where I am to be playing. Having to set up in an uncomfortable area or one where my sound is compromised. Working in excess heat (or cold), bare ground (very dangerous) or a smoke filled hall. Having my hours changed at the last minute forcing me to either wait around to start or play late and possibly miss a later booking on the same date. Having to chase my pay. The big reason you probably don't see acts like mine waltzing in and playing just a couple of songs is because the equipment that is required to do what I do requires more time and space than most folks expect. The appropriate act for a two or three song event is a strolling guitarist. This is not what I do. 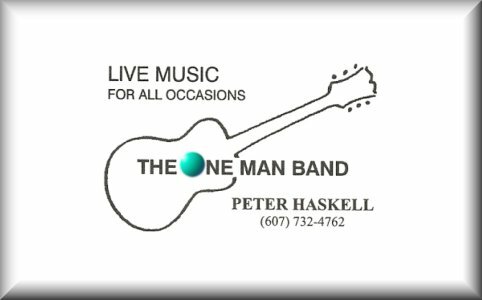 I have been doing my One Man Band Act since 1990 and have played in bands since 1959. That means I have been at this for over fifty years. I suppose the conditions I stated above might be construed to reflect a sort of Prima Donna attitude on my part but I feel I have paid my dues and I therefore expect the courtesies reserved for a gentleman of my age and professional experience.